We delve into the world of colour in this collaborative series with Paris-based designer Calla Haynes (CALLA). Inspired by the foot stools commonly found in the Souks of Morocco, these playful stools and bench will perk you up and spur your curiosity. Recycled fabric from the refuse of French luxury fashion houses is hand twisted to create a traditional Moroccan rag cord. The cord is then hand woven to form the seat, creating a unique and dynamic composition of tone and texture. Just as the cord invites you to look a little closer, so to do the oak legs. Seemingly simple geometry hides a trick of the turner’s trade - an offset turning that enables strong, yet balanced proportions without fanfare. After putting her ready-to-wear collection CALLA on hiatus in 2015, Haynes wanted to do something meaningful with her unused fabrics. Partnering with artisans in Morocco, she began creating one of a kind Berber carpets that have charmed the press (Wallpaper, Elle Decor, House & Home) and lead to a pop-up with Holt Renfrew. 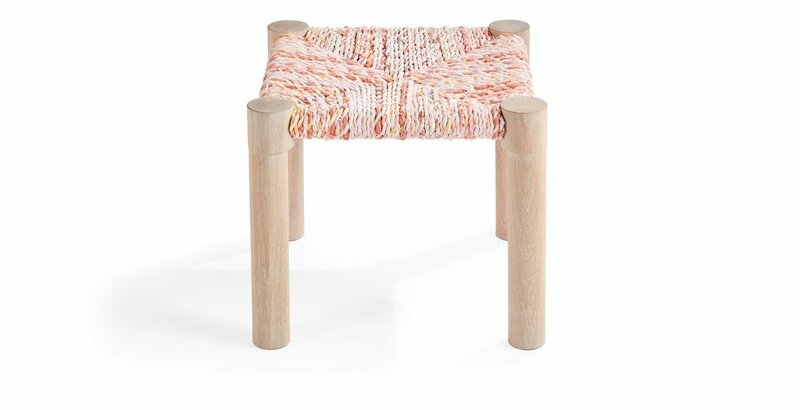 Wanting to take the idea of recycling luxury fabrics further (and saving them from landfill), Haynes shared with Coolican & Company the concept of the Moroccan footstools.